With Christmas lights sparkling in cities all around the UK, department stores festooned with lights and decorations and Christmas songs starting to be played on the radio, it is clear that the festive season is just around the corner. But will it snow…? The last widespread white Christmas in the UK was in 2010, when over 80% of the country woke up to snow on the ground, and about 20% experienced falling snow. The official definition of a white Christmas according to the Met Office, however, is based on the occurrence of falling snow rather than lying snow – to be precise, a single flake of snow falling on 25 December anywhere in the UK. Hence, 2015 was actually our most recent white Christmas – snow fell over about 10% of the country, but it did not settle on the ground anywhere. Snow is not an uncommon wintertime feature in the UK. The average number of days of snowfall in the UK ranges from about 10 in the south of England to over 60 in the Scottish Highlands. However, snow days tend to happen later in the winter – on average, there are fewer snow days in December in the UK than in any of January, February or March. 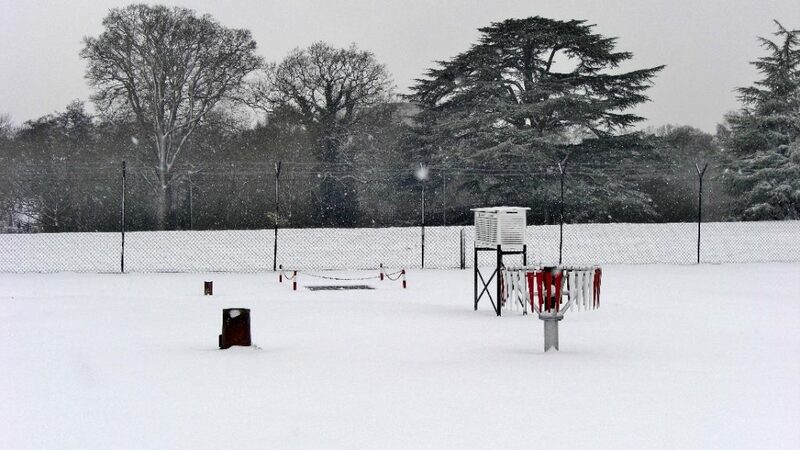 Figure 1: Snow at the Atmospheric Observatory at the University of Reading, although not at Christmas – on 18 January 2013. Photo © Jon Shonk. For snowflakes to reach the ground, we need the temperature of the air to be cold (less than 2 °C) all the way to the surface. In the UK, air that cold typically comes either from the north in the Arctic, or the east from Siberia. If they are to land and settle, we also need the ground to be cold so that they do not immediately melt. Forecasting snow, however, is a challenge: small forecast errors in the atmosphere could affect whether precipitation falls as rain or snow (or indeed sleet). The chaotic nature of the atmosphere means that any errors creeping into the forecast will grow with time and, the longer the range of the forecast, the greater the uncertainty in the prediction. This makes reliable snowfall forecasts for individual days impossible beyond about five days ahead. However, at longer ranges, we can still make useful forecasts based on longer-term trends in the weather. For example, forecasts can show whether the weather is likely to be dominated by settled, high-pressure conditions, or unsettled low-pressure conditions, or indeed whether it is likely to be warmer or colder than average. At a month ahead, we cannot predict weather conditions for a single day, but we can begin to get an idea of what the overall weather pattern might be like. Figure 2: Rainfall equivalent at the University of Reading Atmospheric Observatory on Christmas Day since 1980, with snow days highlighted with pale blue lines. Despite several recent years being declared white Christmases on a national scale, the previous white Christmas in Reading was in 1999. There was snow on the ground in 2010, but it fell on preceding days. Note also that the snowfall on 1996 must have been very light and short-lived with zero rainfall recorded in the rain gauge. So what can we expect from the weather this year? Well, this far ahead, unsurprisingly, there is a great deal of uncertainty. Currently, the Met Office is forecasting unsettled conditions in the week of the festive period and slightly warmer-than-average temperatures, which suggest that a white Christmas is less likely. But recent news headlines have also been predicting very cold and snowy conditions over Christmas – on the weight of these forecasts, despite the contradiction with the Met Office, many bookmakers have slashed their odds of a white Christmas. At this stage it is too early to predict with any reliability whether we will have a white Christmas. The best advice is to keep watching the long-range forecast and see how it evolves as Christmas gets closer. It is only in the last few days running up to Christmas that we will get an idea of the real chances of a white Christmas. In the true spirit of the festive season… here’s hoping. At noon yesterday, the temperature stood at just -3.5 °C, and with a strong north-easterly wind the windchill value made it feel more like -10 to -12 °C – approaching frostbite thresholds. Snow fell and drifted throughout the day, although fortunately Reading didn’t see as much snow as in other parts of the country, and the temperature rose very slowly throughout the day and into the night as less cold air associated with storm Emma began to push in from the south. The temperature finally reached a balmy (or it is barmy? This is the first month of Spring, after all!) -0.9 °C at 2 a.m., according to our automatic weather station within the campus’s Atmospheric Observatory. In over a century of weather records, this was only the third March day to remain below freezing throughout, and easily surpassed the previous coldest March day – 6 March 1942, when the day’s highest temperature was only -0.6 °C. This has been a week for weather records. On Sunday (25 February), we had the sunniest February day since our sunshine records commenced in 1956, with 9.6 hours of unbroken dawn to dusk sunshine – a pretty impressive total for a summer day, never mind February. This helped push February’s sunshine total up to 123 hours, our second-sunniest February on record, and a total which actually surpasses some recent summer months – June 2016, for example, which managed just 116 hours despite much longer days. Unfortunately, clear skies at this time of year also bring cold nights, and on Wednesday morning the air temperature fell to -7.6 °C, the coldest morning for six years and the lowest temperature so late in the winter since 1947 (when -11.3 °C was recorded as late as 7 March, following the bitterly cold February of that year). One thermometer just above the snow surface fell to -15.2 °C on Wednesday morning, the lowest ground temperature for over 30 years (-16.5 °C was recorded during February 1986). Brrr! Roll on Spring! It often comes as a great surprise to residents of Reading and the surrounding areas to find that sea breezes occur this far inland. In fact, they are not uncommon: in an average year we see around half a dozen, more in warmer summers. There have been several in the recent warm weather, some very pronounced and usually providing welcome evening relief to the day’s heat. Most of our sea breezes originate from the south coast, although occasionally one can be traced back to the Thames estuary. They often arrive as a sudden gust of cooler, damper air accompanied by a freshening breeze and sometimes an increase in cloud, typically between about 6 p.m. and 8 p.m. on warm, sunny evenings between May and August – very occasionally as early as late March or as late as early September. Onset can be very sudden: an excellent example occurred just a few days ago. The top plot on Figure 1 below shows the rapid jump in humidity and fall in temperature resulting from the passage of the sea breeze over the Observatory instruments at 1905 GMT (8.05 p.m. BST) on Wednesday last, 5 July 2017; the middle plot shows wind direction (1 second values each minute, in degrees) and the bottom plot shows the 10 m wind speed (maximum and minimum 1 second values in each minute, the 1 minute mean given by the red line). The change in wind direction and speed, from a light easterly to a fresher south-south-westerly, is very pronounced. Figure 1. Air temperature, relative humidity, wind direction and speed recorded at the University of Reading Atmospheric Observatory 1800-2030 GMT on Wednesday 5 July 2017, illustrating the passage of a marked sea breeze front. Data are plotted at 1 minute intervals: air temperatures, relative humidity and mean wind speeds are 1 minute means, wind direction is 1 s spot values and wind extremes are maximum and minimum 1 s values, all ending at the time shown. 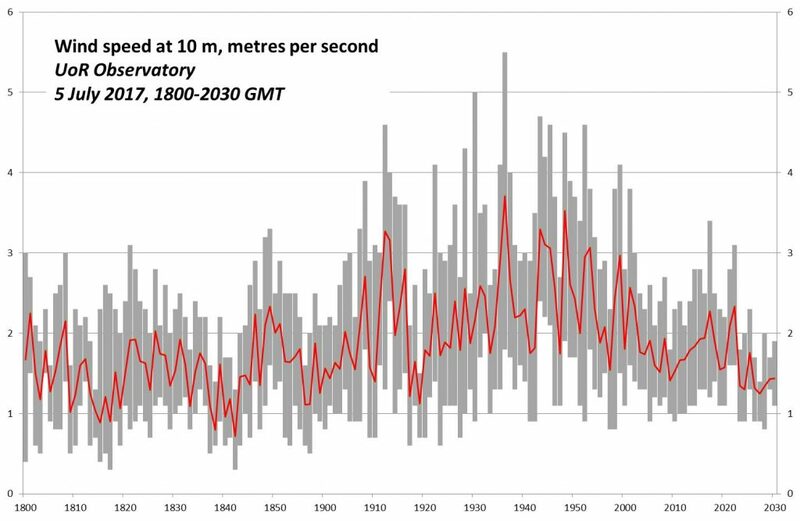 This particular sea breeze reached Chilbolton (50 km south-west of the Observatory) at 1530 GMT (humidity record, Figure 2), while its passage was recorded on instruments at 1826 GMT at Stratfield Mortimer (10 km south-west), 40 minutes earlier than at the University – a typical forward speed of around 11 km/h (6-7 mph). Figure 1. 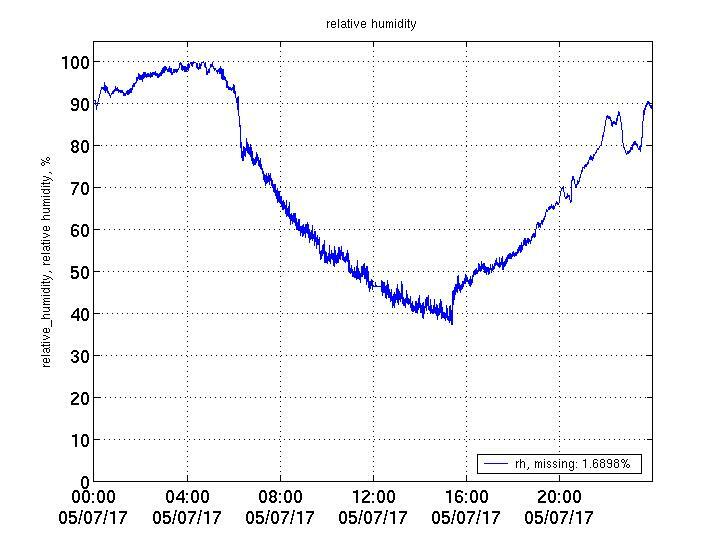 Relative humidity recorded at Chilbolton, Hampshire, Wednesday 5 July 2017: the sea breeze front reached Chilbolton just after 1530 GMT, as indicated by the abrupt rise in humidity. Most sea breezes are entirely benign, indeed welcome at the end of a hot day. Sometimes, the convergence of one or more inbound sea breezes and warm air inland can kick off significant convective activity. On 7 May 2000 a series of evening thunderstorms developed across Berkshire along the line of an earlier sea breeze front: only 5 mm of rain fell at the university, but 87 mm was recorded at an unofficial raingauge in Bracknell, most of this falling in little more than an hour. Much important theoretical and practical work on sea breezes was undertaken within our Department by John Simpson and James Milford in the 1970s, using a mixture of numerical and physical models together with observational campaigns involving surface instruments and a powered glider. A lasting legacy of this work was the book Sea Breeze and Local Wind by John Simpson (Cambridge University Press, 1994) – there is a copy in the Department library, and it is an excellent summary of this aspect of local meteorology. Automatic weather stations (AWS) are increasingly commonplace in meteorological reporting systems: today more than half of all surface observations come from sites that are partly or fully automated. AWS have many advantages, particularly in remote sites, or providing observations outside of normal working hours (for instance, almost all UK night-time synoptic observations are now made by AWSs). Despite advances in computer technology and image recognition systems, however, automatic observations of cloud amount and types are still pretty much hopeless, and are best left to manual observing sites. So how do we ensure global consistency in cloud reporting? Is cumulus humilis reported in the observation from Shanghai the same type of cloud reported from Los Angeles International Airport? While cumulus, stratus and cirrus are very easy to distinguish, how are observers trained to tell the difference between cumulus fractus, cumulus humilis, cumulus mediocris and cumulus congestus? The differences are very important – one can be a sign of fair weather and very limited convective activity, another in this series denotes deeply unstable conditions, with showers or thunderstorms likely within the next hour or two. 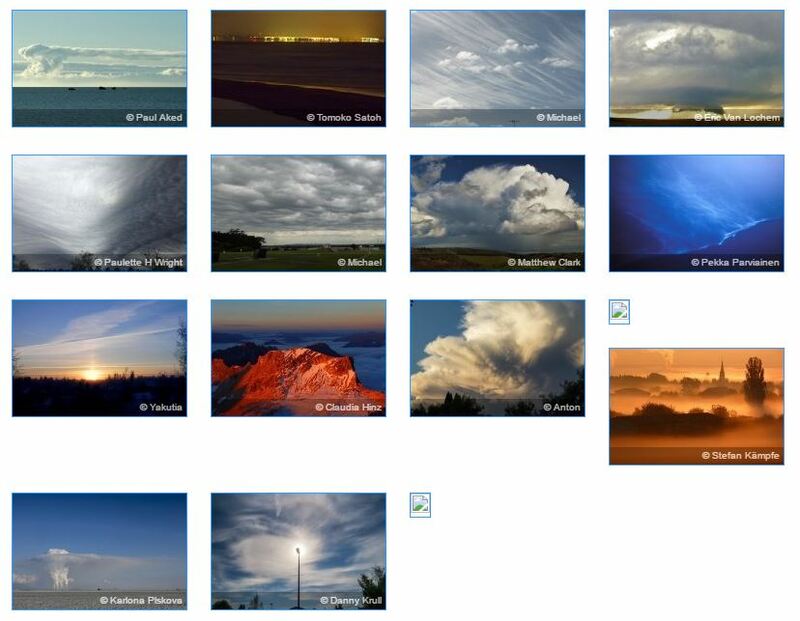 Of course, the answer has to be some kind of visual reference aid for observers – and the latest WMO version of the International Cloud Atlas has just been published on the web. 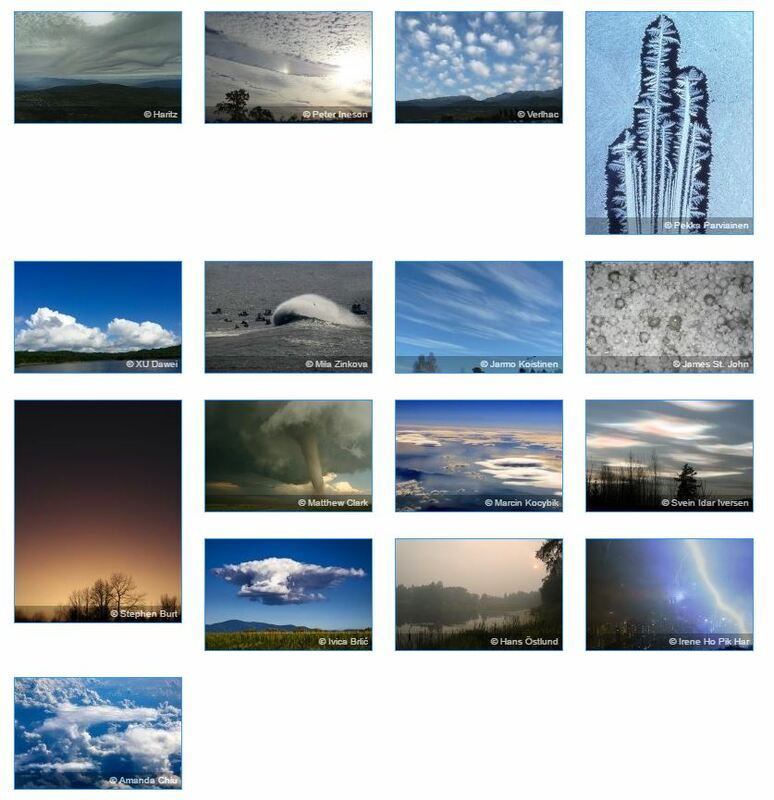 It includes hundreds of photographs of clouds and related phenomena in full colour, including for the first time entries for lightning, contrails, rainbows, solar haloes, rime ice and noctilucent clouds. The first published classification of clouds only dates back to the beginning of the 19th century and was the work of Lamarck (1802). This celebrated French naturalist did not set out to classify all possible clouds; he confined himself to distinguishing certain forms which seemed to him to be the manifestation of general causes which it would be useful to recognize. But this work, in spite of its real value, did not make any impression even in France and his nomenclature does not seem to have been used by anyone. Perhaps this was due to his choice of somewhat peculiar French names which would not readily be adopted in other countries or perhaps the paper was discredited through appearing in the same publication (Annuaire Meteorologique), as forecasts based upon astrological data. The real breakthrough came about later that same year, when London chemist and amateur meteorologist Luke Howard published a cloud classification entirely independently of Lamarck’s which remains very largely the one we use today. Whereas Lamarck contented himself with defining and naming a certain number of interesting forms, Howard set out to establish a complete classification covering all possible cases and, importantly, began to suggest the physical mechanisms behind their formation – heap clouds (cumulus), layer clouds (stratus), and fibrous (ice) clouds (cirrus). From these three basic types, all others were derived by transition or association. His original paper On the modification of clouds was published early in 1803, and influenced artists (John Constable owned a copy), poets (Goethe was a great admirer) and the general public as well as the embryonic science of meteorology; it included exquisite watercolours of each of his main cloud types. His original artwork is held in the Science Museum on behalf of the Royal Meteorological Society. The first photographic Cloud Atlas was published in 1896. It was based upon the work of a Swede (Hildebrand Hildebrandsson) and a titled English aristocrat, the Hon. Ralph Abercromby, who published a classification of clouds reconciling existing customs and including later acquisitions, such as altocumulus, altostratus and cumulonimbus. The super-rich Abercromby had previously made two journeys round the world in order to assure himself that the cloud forms were the same in all parts – well, that was his excuse, anyway, and why not indeed? One of the principal characteristics of this classification was the importance attached to height as a criterion, and they grouped the clouds in four levels, the mean heights of which they fixed provisionally from measurements made in Sweden (of course, this was long before radiosondes and aircraft measurements). The International Meteorological Conference, held at Munich in 1891, expressly recommended these authors’ classification and gave its sanction to the appointment of a special committee entrusted with its final consideration and publication with illustrations in atlas form. This committee met at Uppsala in August 1894 and proceeded to choose the illustrations to be reproduced. With this object in view, an exhibition of more than three hundred cloud photographs or sketches had been arranged (remember photography was still a fairly specialised and expensive occupation, and of course monochrome only). The publication commission, consisting of Hildebrandsson, Riggenbach and Teisserenc de Bort, had to contend with great technical and more particularly financial difficulties. In the end, Teisserenc de Bort took upon himself the sole responsibility for the production of the atlas. This work contained 28 hand-coloured plates accompanied by a text in three languages (French, German, English) giving definitions and descriptions of the clouds together with instructions on how to observe them. This first International Cloud Atlas constituted a great advance by making cloud observations throughout the world truly comparable with one another. Following a 1910 reprint with only slight modifications, the increasing importance of aviation led to the setting up of a new International Commission for the Study of Clouds in London in 1921. This eventually led to a new and expanded Cloud Atlas in 1930, reprinted again with minor modifications in 1939. A completely new edition was agreed in 1947 but was not published until 1956, while minor changes were made in a 1975 edition which, until now, stood as the meteorological community’s definitive cloud classification tool – despite many of the photographs being in black-and-white, mostly 60 or 70 years old, and almost all from temperate latitudes within the northern hemisphere. This new Atlas has been in preparation for 5 years, and came about partly from pressure from Gavin Pretor-Pinney of the Cloud Appreciation Society to include a ‘new’ type of cloud – originally proposed as asperatus (wave-cloud), now recognised in the new publication as asperitas. Work on asperitas clouds was also undertaken within the Department of Meteorology. The opportunity was also taken to update the photographs used, to expand their coverage from all parts of the globe, and to include much more detail on their synoptic environment (including, in many cases, near-simultaneous satellite imagery). The result is a collection of images which, while meeting is desired training and reference objectives, is also a work of art, and an inspiration to all of us to look up at the sky … the world’s greatest free art gallery! While the days of people tuning in to the television to learn whether it will rain tomorrow aren’t over yet, smartphone apps have already begun a revolution in the way we obtain forecasts. However, these apps often simplify the data to present a black and white picture – for example, rain or no rain – when the reality is, like the Great British skies, somewhat greyer. The original data from agencies like the Met Office or AccuWeather often clearly portrays this uncertainty, yet many apps present only the most likely outcome. The Met Office responded to Mr Giles’ comments by saying members of the public are more concerned about the impact of weather on their day-to-day lives than the meteorological processes behind it. Making forecasts that allow people to make well informed decisions based on uncertain forecasts is a really important area of research in which Meteorologists can learn a lot from other fields like psychology and information design, something which our research team at Reading has been exploring. One of the exciting parts of thinking about how weather forecasts are produced is that technological development has meant that there are an almost limitless number of ways in which forecasts can be produced and tailored to individual end users. The challenge for both the public and private sectors is coming up with innovative ways of displaying weather forecast information that are fun and enjoyable to use, while also being informed by our current understanding of how humans process complex information. But with this week’s criticism of current forecasts, it seems really important to develop a dialogue between academia, forecast providers and the public about what our weather forecasts will look like in the future. Research on how best to present weather information will be presented by Reading scientists at a Royal Meteorological Society public meeting on 20 September 2017 entitled ‘Message impossible? Conveying weather information in the digital age’. This is a public meeting and we will shortly be launching a way for members of the public to get involved with the meeting and tell us the new ways they would like to see and use weather forecasts. This tongue-in-cheek look at Reading’s weather in winter and its relationship to cycling safety was prompted by a couple of ice-related accidents experienced by members of staff during the cold and foggy weather of the morning of 24 January 2017 while cycling over the new cycle/pedestrian bridge in the town. 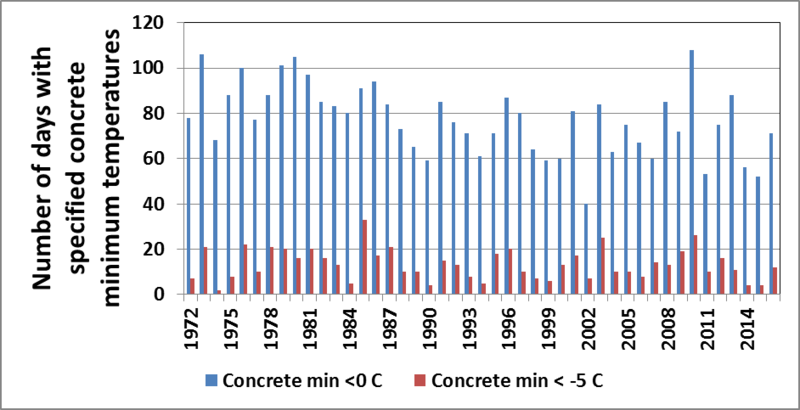 The University’s Atmospheric Observatory, along with several other UK climatological stations, has been recording concrete minimum temperatures since about 1971 (1972 is actually the first year at the university with a complete annual record). Such measurements were begun in the days when road traffic was beginning to increase in volume and the impact of cold weather on road surfaces was identified as being a potential problem. A greater understanding of the climatology of road surface conditions was therefore sought – in addition to the traditional ‘state of ground’ and snow depth reports. The measurements are made in a similar way to that used in determining the grass minimum temperature – measurements are made using a grey concrete slab about 90 x 60 cm, and about 5 cm thick. If snow falls and covers the concrete slab, then the slab is swept clear of the snow (without disturbing the index of the thermometer) – and the concrete minimum thermometer replaced on the slab. Figure 1. 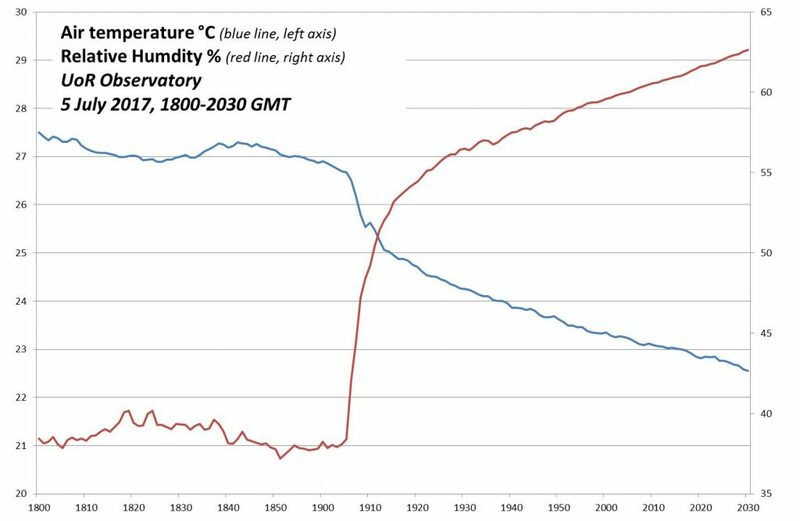 Annual incidence of concrete minimum temperatures below 0 °C (blue) and below -5 °C (red) at the University of Reading during 1972-2016. 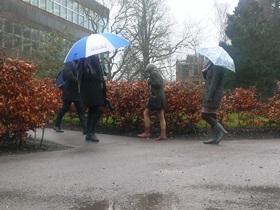 As with many winter-time meteorological measurements at Reading there are large inter-annual variations. Figure 1 show that a concrete frost (when the reading drops below 0 °C during a 24-hour period) has varied between about 40 and 100 nights in a calendar year, while a sharp frost (a reading below -5 °C) has occurred on between 2 and 33 days in a year. 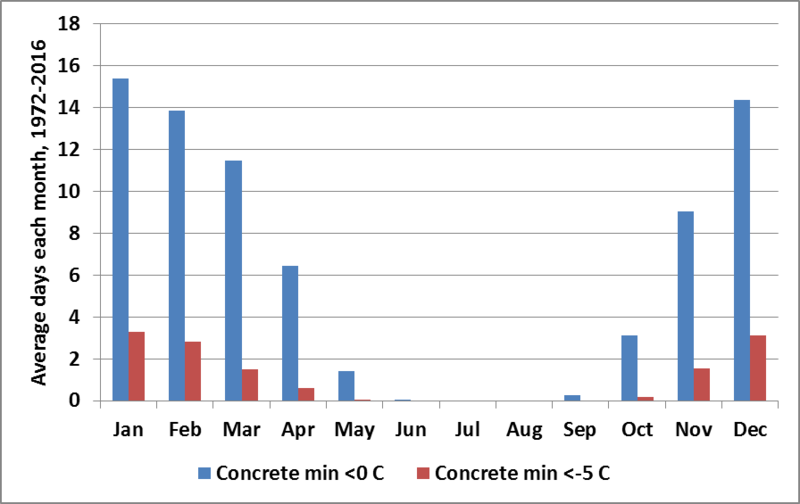 Figure 2 shows the distribution of concrete frosts within the year. An average of 75 concrete frosts and 13 sharp concrete frosts can be expected in a 12 month period. Concrete frosts have been recorded as late as the first week of June (1991 and 1994) and as early as 16 September (in 1975). Figure 2. Average monthly incidence of concrete frosts at the University of Reading, averaged during 1972-2016. Lying snow – we record the state of the ground and the depth of any lying snow, so an indicator of days with lying snow (at 0900 UTC) is easy to determine. In this analysis the presence of any snow cover is included, not just the usual ‘at least 50% cover’ days. Surface ice – we record this when there is no snow lying on the grass in the observatory. Sometimes lying ice is the result of melting snow that has subsequently frozen, rather than the result of North American-type ice storms. Frozen ground – this can result (as was the case in January 2017) in frost persisting and building up on the surface throughout the day if the surface remains in shade and the daytime air temperatures do not rise too much. Freezing fog at 0900 UTC (or in the preceding hour) – if thick enough and prolonged enough this can lead to the deposition of rime and ice. Unfortunately, we only have visibility measurements at 0900 UTC along with indications of fog in the preceding hour if it has cleared by this time. 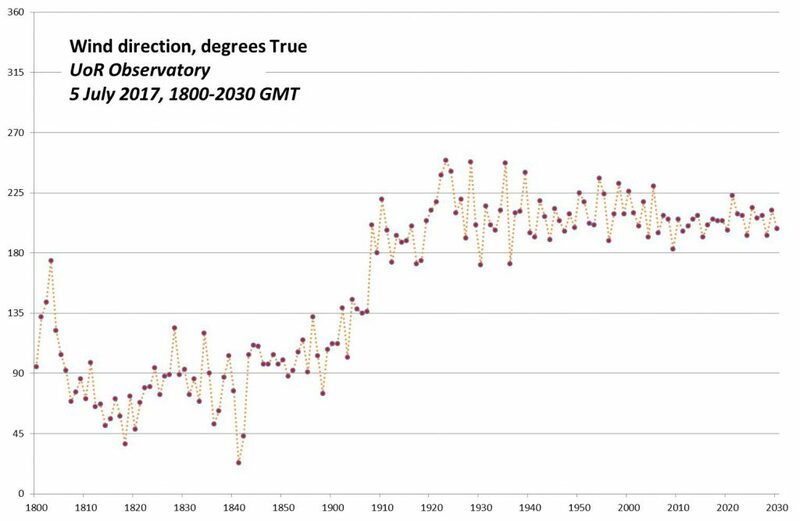 The incidence of these four conditions were extracted from the daily register of 0900 UTC observations made at the university and the occurrence of these ‘hazardous days’ throughout the year was then examined – see Table 1. Table 1. Occurrence of hazard days at the University of Reading, 1972-2016. Table 1 suggests that such weather hazards occur on about one day in five to one day in three in the three winter months in Reading, with frozen ground and/or lying snow being the most prevalent type of hazard. Clearly with these occurrence frequencies, periods of consecutive days with weather hazards are more than likely in most winters. In particular, during 1972-2016 there were 25 instances of spells of at least three consecutive days each of which had greater than 50 % snow cover (an average of more than once every second winter season). In addition there were 156 of spells of at least three consecutive days each with an instance of hazardous weather in the same period – or 3.4 spells each year on average. The Council does not promote the use of bicycles during periods of prolonged hazardous conditions. With the exception of shared carriageway routes on a primary or secondary precautionary salting route shared footway/cycleways and remote cycleways are not salted when frost, ice or prolonged hazardous conditions are forecast. Being part of the carriageway, shared carriageway/cycleway routes on the primary and secondary precautionary salting route networks will be salted by default in accordance with the Winter Service Plan. METEOROLOGY BUILDING GETS A WEATHER VANE AT LAST – BUT CAN YOU UNDERSTAND ITS CODED MESSAGE? A new weather vane with a hidden message has been unveiled on the roof of the University of Reading’s Meteorology building after being chosen as the winning design. The weather vane was created by Dr Helen Dacre, associate professor in Meteorology, and selected by an expert judging panel. The winning entry was announced by Reading-trained TV weather presenters Holly Green (BBC) and Laura Tobin (ITV). It was officially revealed to University staff and students on Friday 16 December by Dr Dacre, who was joined on the roof of the Meteorology building by Vice Chancellor Sir David Bell. The Meteorology building was equipped with a weather vane mast when it was completed in 1996, but has remained without a vane ever since. So, as part of the department’s 50th anniversary celebrations last year, the University turned to its own academics to solve this. “Since the Meteorology building was opened, we have been quite effectively making the weather – but it remains occasionally useful to know which way the local wind is blowing,” said Professor Giles Harrison, head of the Meteorology department. And Dr Dacre’s design, made into stainless steel reality by a specialist company, is complete with a hidden message. But understanding it requires a little meteorology knowledge. The design is based on the station circle symbol used to plot weather station data on maps – with the accompanying number representing the temperature. The flag and lines (known as wind barbs) represent the wind speed and direction – a flag represents 50 knots, and the full and half barbs represent 10 and 5 knots respectively. The vane therefore shows 65 knots of wind. So, eagle eyed students will be able to read 1965 – the year the department was established. Have you been asked for your ORCID ID yet? Increasingly, research funders, employers and publishers are asking their researchers to sign up for an ORCID ID. An ORCID® identifier or ORCID iD is a 16-character identifier that can be used to clearly identify you – and not another researcher by a similar name – as the author/owner of an academic output or activity. Your name is unlikely to be unique and you may find that your research outputs are getting confused with those of another researcher with a similar name. An ORCID ID can be particularly useful for researchers who have published using several different variants of their name and initials or have published under different names (for example if you’ve changed your name through marriage/civil partnership/divorce or to suit your gender better). The idea behind ORCID identifiers is that they should be a stable link between all your research activities – grant applications, manuscript submissions, publications, entries in institutional repositories and your peer review activity. 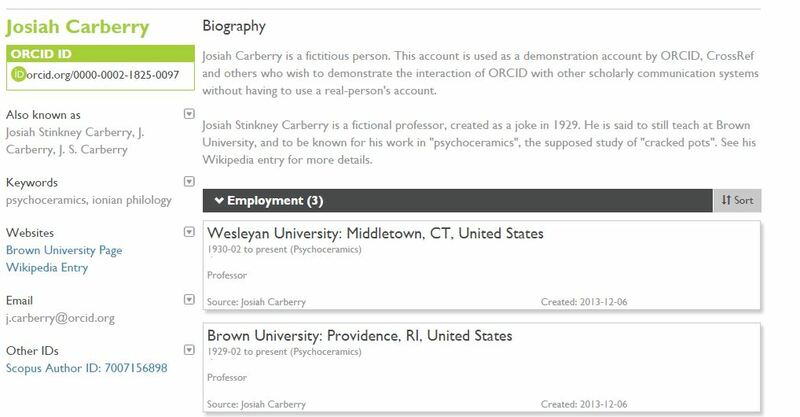 Your ORCID ID belongs to you and you control what information is added to your ID. You can choose to use your ORCID profile as a mini-CV listing all your publications, work history and funding or you can just use the number to identify you and your research outputs. Once you have an ORCID ID, make sure you add it to your registration details on manuscript submission sites and other sites such as ResearchFish. ORCID is a non-profit organisation that is governed by a board of directors with wide stakeholder representation. Member organisations such as funders, publishers and institutions pay a membership fee but signing up for an ORCID is free. Your ORCID ID is a 16 character number that identifies you and not someone else with the same name. How do I register for an ORCID? It is very easy to sign up for an ORCID ID – registering for your ORCID Identifier takes about 30 seconds. You can then add as much personal information as you want to your record. The minimum recommendation is that you add the country that you are working in, some keywords about your research area and possibly a link to your university webpage. It is always a good idea to add an alternative email address just in case you ever have difficulty accessing your account. You can add much more information about your research outputs and use your ORCID like a mini-CV. Take a look at our ORCID library guide for more help on how to sign up and populate an ORCID ID or contact the University’s Research Publications Adviser. The ORCID support centre is also full of useful information. A short vimeo video shows how ORCID IDs can help researchers gain credit for all their scholarly activities. Next week is ‘Open Access Week’ , and to celebrate this, all Royal Society journal content will be completely free to access from Friday 21 October until 6 November. Solar eclipses rarely cross populated regions, but provide great opportunities both for science and science outreach when they do. The recent 20 March 2015 solar eclipse tracked across the Atlantic, giving substantial solar radiation changes in the UK and Iceland, and totality in the Faeroes. This Theme Issue of the Philosophical Transactions of the Royal Society brings together a unique series of studies on effects of eclipses on the weather, placed in the context of societal responses to eclipses. Professor Giles Harrison from this department was joint lead editor on the issue, and the journal includes contributions from many members and ex-members of the Department of Meteorology at the University of Reading on a very wide variety of topics. Investigating effects of eclipse-induced weather changes (e.g. in surface air temperatures, wind and cloud amount) has a long history, usually exploiting observations made during the eclipse for comparison with comparable non-eclipse conditions the day before or after. New approaches to study the weather-related changes are now possible, employing high resolution numerical models of the atmosphere in which an eclipse can be turned on or off at will, combined with the extensive coverage of good quality amateur and professional weather data available. This issue includes work analysing surface, balloon and satellite observations, alongside high resolution numerical modelling studies. In doing so it defines a new interdisciplinary research area in eclipse weather, closely focussed in scope, but diverse in the work it contains.